Following the success of the straw-bale house at the Festival, we were asked to build something new for this year. We decided to build with cob and cordwood, and to create a covered sitting space from which people could view the straw-bale house and surrounding gardens. We ran a series of three workshops, each one on a consecutive weekend, attended by people from all over the country — all there to learn natural building techniques. Cob is a technique for earth building indigenous to the UK and Ireland. Many such inhabited buildings still exist in Ireland, and over 50,000 still exist in the UK. It is undergoing a revival in America thanks to the work of companies such as the Cob Cottage Company. Cordwood is an American technique where logs are mortared together, conventionally with cement or lime, but more recently with cob, creating what is known as “cobwood”. We had previously built with cob but were keen to have a go at cordwood, having read a lot about it. We began with a stone foundation and dug the subsoil needed from the foundation and from nearby. 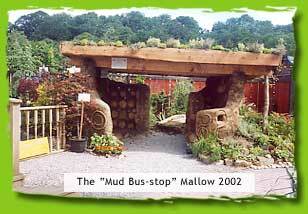 The soil had a good amount of clay in it, the area around Mallow having a strong historical tradition of earth building. We mixed cob by foot on tarpaulins and then built it up from the foundation. Building with cob is a bit like building with plastercene, it allows you to be very sculptural. For the cordwood we used pine logs cut into 18″ lengths. These were mortared together with cob. For an inhabited house you would put some insulation in the middle to avoid creating a “cold bridge”, but for ours we just used the cob. We set coloured bottles into the cob, as well as a couple of windows. The walls were very curved and sculptural. We experimented with corbelling — specially made cobs for spanning long distances, created by running all the straw in the same direction. This worked very well. We also made sculptural embellishments, which looked beautiful and were very satisfying to do. The roof was topped off with turf and with herbs growing all around. The finished building looked beautiful and generated a lot of interest during the show. Unfortunately the cob was still moist so no one could use it as a bench without getting muddy trousers! For next year’s show it will be fully dried and will be plastered with earth plasters.